Lime green plastic flower-shaped hair bobbles - found on the playing field, Derrywood Park, 2nd September. Bone china cup and saucer - found on a bench in Riveria Public Gardens, 31st October. Anthony Peardew is the keeper of lost things. Forty years ago he carelessly lost a keepsake from his beloved fiancée, Therese. That very same day, she died unexpectedly. Brokenhearted, Anthony sought consolation in rescuing lost objects - the things others have dropped, misplaced, or accidently left behind - and writing stories about them. Now, in the twilight of his life, Anthony worries that he has not fully discharged his duty to reconcile all the lost things with their owners. As the end nears, he bequeaths his secret life's mission to his unsuspecting assistant, Laura, leaving her his house and all its lost treasures, including an irritable ghost. Recovering from a bad divorce, Laura, in some ways, is one of Anthony's lost things. But when the lonely woman moves into his mansion, her life begins to change. She finds a new friend in the neighbor's quirky daughter, Sunshine, and a welcome distraction in Freddy, the rugged gardener. As the dark cloud engulfing her lifts, Laura, accompanied by her new companions, sets out to realize Anthony's last wish: reuniting his cherished lost objects with their owners. Long ago, Eunice found a trinket on the London pavement and kept it through the years. Now, with her own end drawing near, she has lost something precious - a tragic twist of fate that forces her to break a promise she once made. As the keeper of lost things, Laura holds the key to Anthony's and Eunice's redemption. But can she unlock the past and make the connections that will lay their spirits to rest? 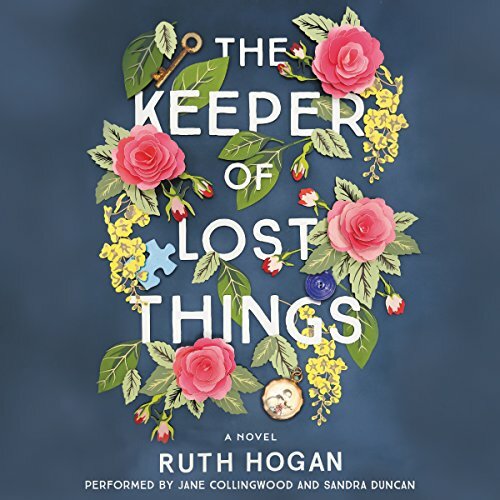 Full of character, wit, and wisdom, The Keeper of Lost Things is a heartwarming tale that will enchant fans of The Particular Sadness of Lemon Cake, Garden Spells, Mrs. Queen Takes the Train, and The Silver Linings Playbook. Charming. Clever. Some comic relief, mixed with poignant moments. Many likeable characters, making for an enjoyable story with a happy ending. No cliff hanger requiring a follow up book. I listened to this book via Audible and found the two narrators to be super, really adding to the story. One voice narrated Laura, and the second did Eunice. Both really good. The book description on the website accurately describes the plot and the book doesn’t veer off in an unexpected direction. A member of my book group had planned to skim past the stories about the lost things, which would be a mistake. Two major timelines throughout the book converge near the end, solving important puzzles that were going on throughout the story. Overall, an uplifting finish that brought people together, helped them resolve a few personal demons, allowed them perform unselfish acts for others, making new friends along the way. Really enjoyed it. Four stars. 20 sur 20 personne(s) ont trouvé cet avis utile. found something and wondered about the path the object has traveled? St Anthony of Padua is the patron Saint of lost and stolen things. And, Anthony, of Padua Cottage becomes the Keeper of Lost Things. You'll get to know Anthony and the love of his life, Therese; Bomber and Eunice; Laura and Freddy, and of course Sunshine. Ruth Hogan intertwines three main stories, and many minor ones, into a feel-good story with a happy ending for 3 couples, ultimately. I really tried with this book, but I had to put it down. The cutesy, but actually offensive, portrayal of &quot;Sunshine,&quot; a character with Down Syndrome, started to make me nauseous. And with only two hours to go until the end, I realized I didn't care one bit about the characters. They're flat, and Freddy doesn't seem to be a character at all--just a manifestation of someone's underdeveloped idea of a perfect young man. The book reads like a student's first draft, and someone should have addressed this before publication. Do yourself a favor and skip this one. I could not stop listening to this book! It’s a great story, wonderfully performed! Highly recommend! Boring. This is a romance novel not a serious novel. Poorly written, racial/ethnic sterotypes, clunky dialogue. Production problem or narration issue? Somewhat distracting that you repeatedly hear the narrators drawing in breath before speaking. Story is sort of all over the place. The narration and even writing were lovely but the story which started out interesting and engrossing soon took a hokey turn and was only minimally entertaining in the last several chapters, at best. Some weak connections and, in my opinion, corny use of the paranormal made the resolution fall flat. Adorable little story that is eventually connected through several smaller bits. I enjoyed the narrator very much. Such a delight and so beautifully written. Also beautifully performed. The author’s words are like a paint brush. Loved the book.